The Aliab Dinka is a Nilotic Sanga. The Aliab Dinka is named after the southeastern Dinka people from the Aliab Valley (a low floodplain west of the White Nile). 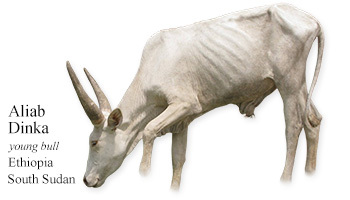 The Aliab Dinka is the oldest variety of the Nilotic Sanga cattle populations, also the largest and best developed with the longest horns. My Daily Cow® Ethiopia and South Sudan and read about other Ethiopian and South Sudanese cattle breeds.